Throughout grade school, I was always a slender kid who was relatively lean and quick, but I was never a full athlete. I was a multisport varsity competitor who would train to be fit on occasion, but the gym was never a top priority. I've had many health issues that have kept me from living up to my full potential. In early high school, I was struck with a collapsed lung, but that wasn't the end of it. I was unaware at the time, but my life for the next four years would be plagued by lung issues. During that four-year span, I endured a total of five collapsed lungs, four surgeries, and five periods of long recovery. Every time I tried to better myself, I got beaten down, ended up with months of recovery time, and went in reverse. After high school sports ended, I got away from the gym for a year or so. Then, while walking around the college campus one day, I passed by the gym and decided to give it a try. Being away from home and around new people let me break out of my comfort zone. I wasn't nervous about embarrassing myself in front of my close friends, and I thought to myself, "Everyone has to start somewhere." A few short weeks later, the fire was lit and I was on my way to a transformation I did not see coming. I started slow with just one hour, three days a week. After a month, I realized that I could push myself further, and ramped up to two hours a day and five days a week while doubling my bank of exercises. Before long, I was a gym rat and loving it. All of my lifts were on the rise, and as the results piled up, I became an even bigger advocate of fitness. The gym gave me the confidence I needed to renew my drive to be an athlete. I joined the track team at Case Western Reserve University and became an NCAA collegiate high, long, and triple jumper. The power increase I gained from weightlifting allowed me to raise the bar not just on the track, but in every aspect of my life. When I had previously tried to get into weightlifting and fitness, I would continually get discouraged because I struggled to gain even five pounds. My metabolism kept sending me backwards. As a hard-gainer, I saw very little gains after a few weeks and turned to my best friend for help. He introduced me to Bodybuilding.com, and that's when everything clicked. One of the changes that took my workouts to the next level was music. I got an armband for my phone, loaded a workout playlist, and hit the gym. It helped me pound out those last few reps. When the motivation wasn't always there, the music would really give me that extra drive to not only complete those last couple reps, but smash through them and get one more. Whenever I thought I was as strong or as powerful as I was going to get, I turned to the greatest resource we have today, the Internet, and watched videos for what seemed like hours. I would find new exercises and new challenges for myself. One specific exercise that caught my attention was the muscle-up. I went to the gym, and for weeks I could not do a single muscle-up. I laughed at my own failure, but the fire had grown that much stronger. Continuing to push myself, to set new challenges, and to reach new heights kept me going. My first muscle-up was followed by smiles, high fives, and motivation to get to two, then to four, then to ten or more. If you ever think your goals or challenges are off, make the necessary changes and get back on track. If your goals are too lofty, keep them, but set more attainable short-term goals. If you think you're not being challenged, take a second look and find something more difficult. There is always a new challenge, a new lift, or a new angle to take when shooting for the stars. Just like the muscle-up, always go above and beyond what you think you can do. My sister always told me, "If you think you can, you can. If you think you can't—you're right." College students are notorious for skipping meals and eating light to stay on track with classes and studying, but for me that had to change. The first thing I did was double and sometimes triple my daily caloric intake. If you are an ectomorph like myself, the key thing you must do to supplement your weight training is to shock your metabolism. Don't let yourself go hungry for hours, and do not skip meals! If you can't do everything, pick one goal and stick to that. A lot of times I would not eat after dinner (sometimes 5 hours before bed). I made it a goal to try and eat 800-1000 or more calories within an hour of going to bed, to keep my metabolism busy while I slept. Below is an example of what a typical day of food might look like. I train five times a week, and play basketball on the weekends. I also have jump/sprint technique workouts Monday, Tuesday, Thursday, and Friday. I like to do my ab circuit toward the end of my workout, and save one really good targeting lift for after the abs. The challenge was to make sure I gave my body enough rest and didn't work the same muscles back-to-back. Lifting five days per week and training for track can start to add up. I'd get asked to go to the gym on weekends a lot, and the pump is a great feeling, but you also have to be dedicated to rest. It's hard to stay away from the gym for more than a few days, but being motivated to get healthy is what's best. I am currently training to push my efficiency to new levels. Every day, I seek to increase my strength to weight ratio. In 2015, I plan to try out for American Ninja Warrior. "I'd get asked to go to the gym on weekends a lot, and the pump is a great feeling, but you also have to be dedicated to rest." Start slowly. Do not fly into the gym for 2 hours every day. You will wear yourself out. Start with 45 minutes a few days a week and build on that. Have patience. No transformation happens overnight. It takes hard work. Stay motivated. Find a buddy to work out with, someone to keep after you. Listen to your body. Give 100 percent while you're at the gym. If you can't, its OK to stay home. If you're tired or sore, don't risk injury by trying to muscle through it. Once I got rolling, Bodybuilding.com took me to another level. I started reading tons of fitness articles and supplement guides that helped propel my training. I got started with protein and creatine, later adding BCAAs and glutamine. My metabolism has always been through the roof, and whenever I tried to get stronger in the past I would always get discouraged by my lack of ability to gain weight. Bodybuilding.com made me realize the changes I had to make. My diet changed from cereal and noodles daily to high protein and quality carbohydrate meals. I made it a point to not go hungry at any point in the day, from breakfast all the way to bed. I referenced meal plans constantly, trying to find new ways to gain weight. 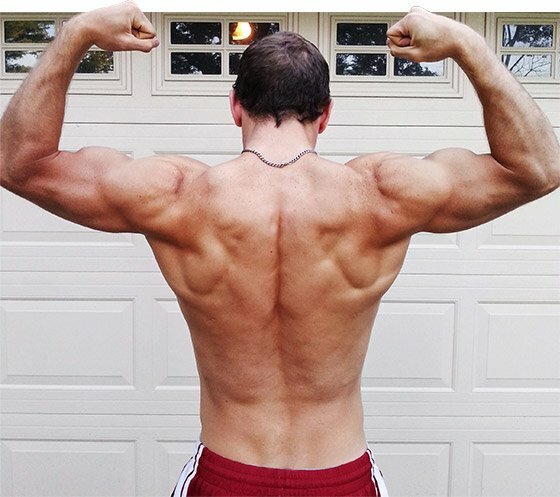 Bodybuilding.com has motivated me more than anything throughout my transformation. Those nights where my buddies were goofing off, I worked on my chest and tris. Transforming myself has given me more confidence in all aspects of my life. I've read so many articles on Bodybuilding.com, and I never thought that I would be sitting here writing one of them. "The Devil's Quid Pro Quo"